I frequently work on projects where we have multiple tiers on which our solution is deployed to using continuous integration / continuous deployment (CI / CD) pipelines in Azure DevOps. Once everything is deployed, you also need to monitor these different environments and check the status of the data or ETL pipelines. My tool of choice is usually Power BI desktop as it allows me to connect to e.g. SQL databases very easily. However, I always ended up creating a multiple Power BI files – one for each environment. Having multiple files results in a lot of overhead when it comes to maintenance and also managing these files. Fortunately, I came across this little trick when I was investigating in composite models and aggregations that I am going to explain in this blog post. To be honest, I barely used Power BI Direct Query in past and so maybe this feature has been there for quite some time without me realizing it but It may also be that it was introduced just recently with composite models. And that’s it already! 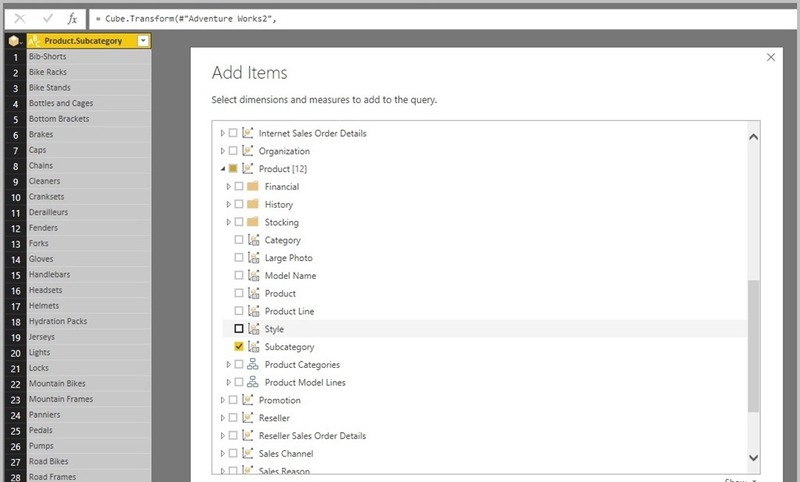 you can now easily switch between different databases by just using Power BI parameters and the Direct Query connection will change automatically to the new server/database. Of course, all the target servers/databases have to have the same schema otherwise, you will get an error. Even though this looks quite trivial, there are some caveats which makes me believe this is not fully supported yet. You may noticed above already that in Power Query, when going to the step that actually queries the database, it complains about that this step would cause the whole table to be converted to Import Mode. However, you can just ignore it and go on with the next step to remain in Direct Query Mode. It seems like Power BI keeps track from where a table was originally imported. So if you want to add a new table, make sure to copy an existing Direct Query table and change it accordingly instead of going to “New Source > …” ! 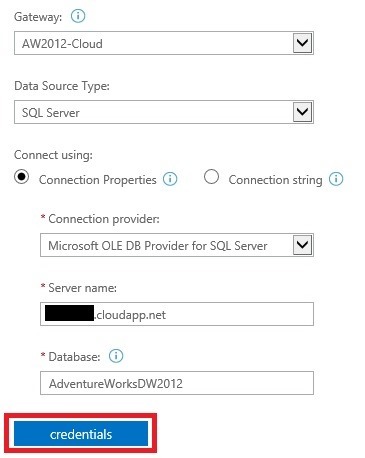 Also, you need to make sure that you have entered the credentials for the different source databases at least once – otherwise Power BI will ask you when you query the database the first time. This is also the reason why this does not work so well in the Power BI service as changing the parameters there is not as simple as it is in Power BI desktop. As I said, I do not know if this is a new feature (or a feature at all), but it is definitely helpful for certain scenarios. I just had the request to expose the UniqueNames of an Analysis Services Multidimensional cube in PowerBI. 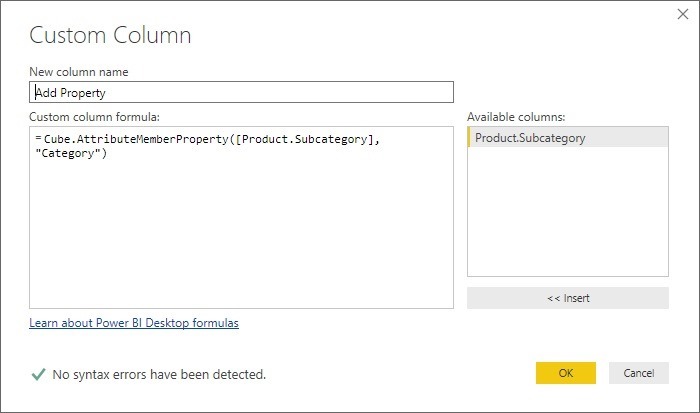 You may ask why I would want to do this and the answer is actually pretty simple: In SSAS MD the caption of elements/members even within the same attribute is not necessarily unique. This is because of the Key/Name concept where the elements/members are grouped by the Key but for the end-user a proper Name is displayed. So if you happen to have duplicate Names in your cube, import the values into PowerBI you will end up with less rows (and wrong values!) compared to the original SSAS MD cube because PowerBI (and also Analysis Services Tabular) does not have a Key/Name concept and therefore the grouping and what is display is always the same. Having worked quite a lot with SSAS MD in the past I knew that every attribute member contains various internal properties, one of them being the UniqueName, which, as the name implies, is the unique identifier for each member regardless of the caption displayed for that member. And that’s exactly what I needed in this scenario. So the question is how to get this information in PowerBI as this is nothing that should usually be exposed to an end-user. 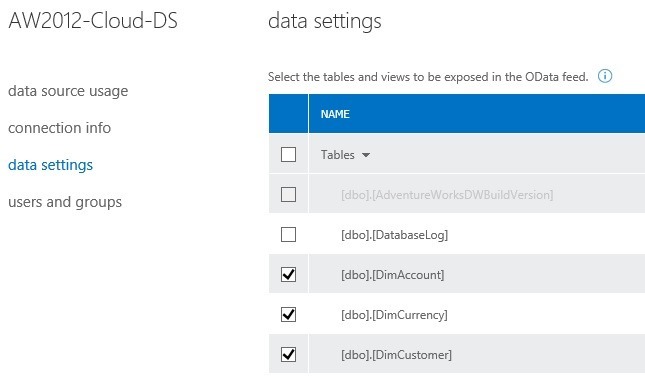 There is very little information in the internet about SSAS MD connectivity with PowerBI for in general (talking about the import-mode here and not the live-connection!). One of the few blog posts I found from Chris Webb is already 3 years old: https://blog.crossjoin.co.uk/2015/01/13/a-closer-look-at-power-queryssas-integration/. The other resource is the official documentation on MSDN (scroll down to the “Cube” functions): https://msdn.microsoft.com/en-us/query-bi/m/accessing-data-functions which does not really provide a lot of information except for the syntax of the functions. The UI is quite limited here and you can only select hierarchies and measures. And that’s already all you need to do. The column [Product.Subcategory] contains various information, one of them being the UniqueName of the product subcategory which can be accessed by the Cube.AttributeMemberId function. This PowerBI Desktop model contains all samples from above including the my failed tries for the properties! In one of my recent posts I explained how to use the Power BI Data Management Gateway to access data hosted in a SQL Server running on an Azure VM. At the time of writing that post the steps to establish connectivity were not quite intuitive. With the latest Update of the Data Management Gateway (Version 1.2.5303.1 and later) things got a bit easier. However, there is still a little thing that you have to configure to make everything work smoothly. First of all, I highly recommend you to read my first post on this topic to fully understand the actual issue and why it does not work out-of-the-box. 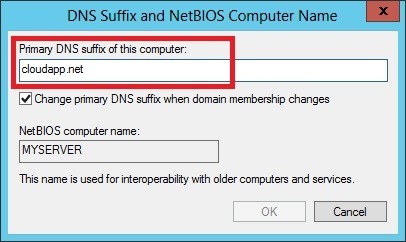 Here we can set our “Primary DNS suffix” – we set it to “cloudapp.net” (without leading dot) to reflect our public DNS name. 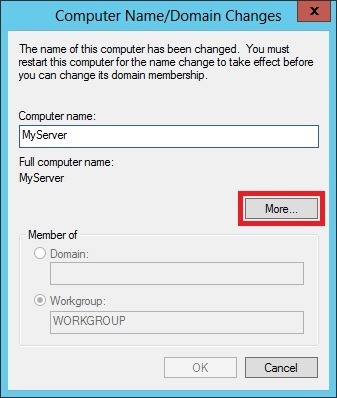 By clicking [OK] on all open windows you will see the new full name “MyServer.cloudapp.net” now being used as “Full computer name” everywhere. Also our Power Shell command from above now shows the correct hostname. Note that this change also requires a reboot of the VM. Once the machine is rebooted and DMG is running again you can now use any client machine to create your Data Source which was previously only possible from the server directly and required a RDP connection. Also HTTPS connectivity with self-signed certificates works with this approach which I will show in one of my next posts – so stay tuned! There were some changes to the DMG in August 2014. Please refer to my new blog post which addresses the issues with the new version! However, I still recommend you to read this post first in order to fully understand the original issue! I am currently preparing some demos and examples for Power BI. As you can expect for demos you do not want to put too much effort in building up any infrastructure so I decided to use an Azure VM to host my SQL databases and SSAS cubes. 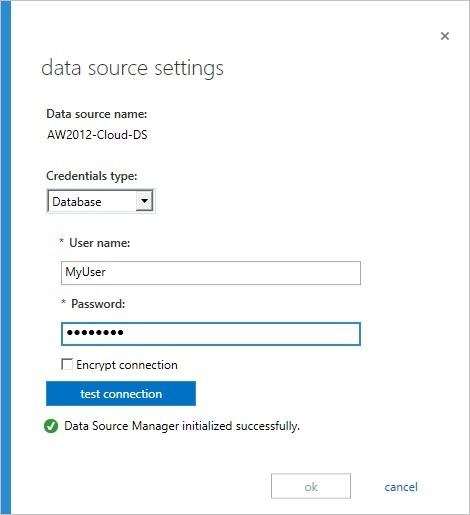 Keeping things simple the Azure VM is not joined to a domain which is fine for SQL where I can use SQL authentication, for SSAS I use msmdpump.dll. After everything was set up I wanted to install the Data Management Gateway to expose my SQL tables via OData to Power Query and Online Search. Bryan C. Smith recently published an article on that very same topic Creating a Demo Power BI Data Gateway using an Azure Virtual Machine but for some reasons it did not work for me. Further, as Bryan already mentions in the first paragraph, his setup is not supported and its also a bit of a hack (modifying hosts-file, and so on). So I started my own investigations and came up with another solution, which only uses out-of-the-box features and tools and is actually quite simple. Another thing to mention here is that it will (probably) not work for scheduled data refreshes but only for exposing the SQL database via OData and make it searchable in Power Query. By Clicking on the [credentials]-button a new window pops up. Please note that this is a click-once application that actually runs on your client and is independent of your actual browser! 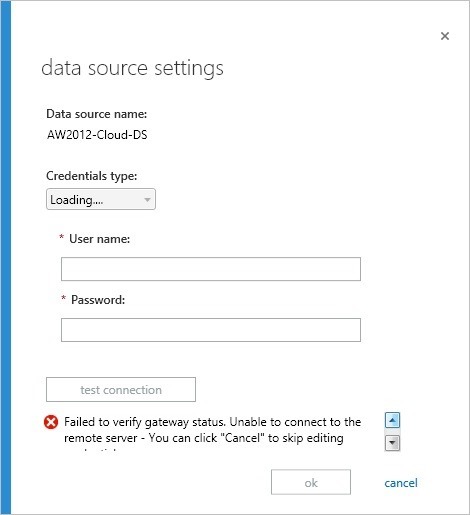 If the Gateway is running on an Azure VM, or basically any machine which cannot be reached from your current client you will receive an error that a connection could not be established or something similar. Assuming you called your Azure VM “MyCloudServer” and is perfectly reachable via “MyCloudServer.cloudapp.net” you will receive an error saying that “MyCloudServer” (without “.cloudapp.net”) could not be resolved. Which is actually true as the correct server would be “MyCloudServer.cloudapp.net”. Unfortunatelly, this server name cannot be changed anywhere as far as I know. As the name cannot be changed we need to make the name somehow “resolveable”. Bryan manually modifies the hosts file and makes “MyCloudServer” point to the public IP address of “MyCloudServer.cloudapp.net”. This should usually work just fine, but somehow did not work for me. 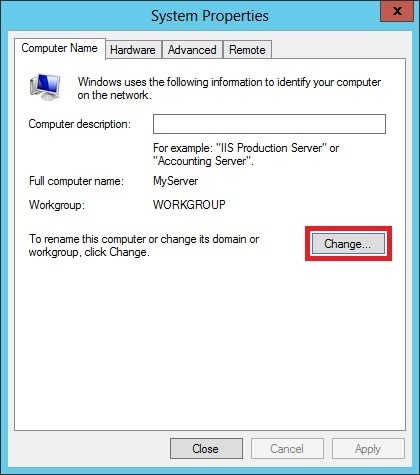 Also the public IP address may change if you reboot your Azure VM and so you would need to modify the hosts-file again. 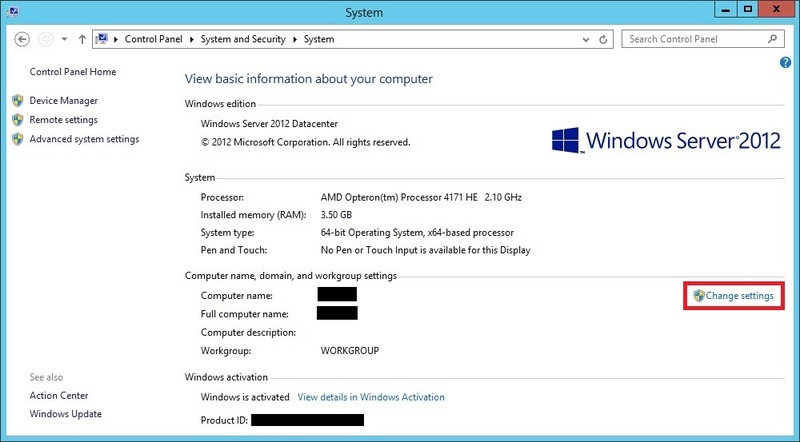 The only machine in my scenario that can correctly resolve “MyCloudServer” is the Azure VM itself! So instead of running the Data Source Manager on my client I simply connected to the Power BI Admin Center from my server and repeated the steps from above there. ). Though, the Username and Password are stored and used for all subsequent connection through the gateway, e.g. for OData access so make sure the user has the necessary access rights. 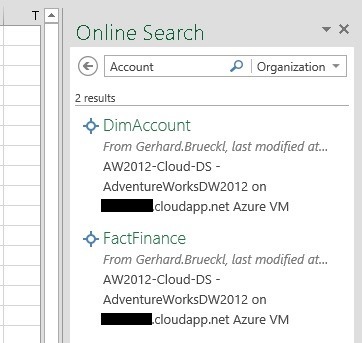 And that’s it – The simple trick is to run the Power BI Admin Center from the server itself and create the data source there! Hope this helps everyone who is dealing with the same issue or wants to setup a demo environment too. Data is the daily bread-and-butter for any analyst. In order to provide good results you also need good data. Sometimes this data is very well prepared beforehand and you can use it as it is but it is also very common that you need to prepare and transform the data on your own. 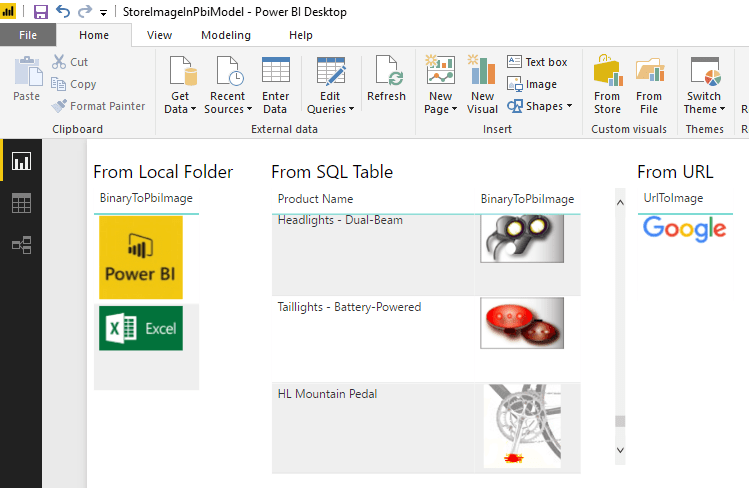 To do this Microsoft has introduced Power Query (on tool of the Power BI suite). Power Query can be used to extract, transform and load data into Excel and/or Power Pivot directly. When using any data you usually know what the data looks like and what to expect from certain columns – e.g. a value is delivered as a number, a text contains exactly 4 characters, etc. Though, sometimes this does not apply for all rows of that dataset and your transformation logics may cause errors because of that. In order to avoid this and still have a clean data load you need to handle those errors. Power Query offers several options to this which I will elaborate in this post. As you can see, the third row was simply removed. This is the easiest way on how to remove errors from your result set but of course this may not be what you want as those removed rows may contain other important information in other columns! Assume you want to calculate the SUM over all values in column B. As we removed the third row we also removed a value from column B and the SUM is not the same as without the error-handling (9 vs. 15)! The M-function that we use is “try <expressions to try> otherwise <default if error>” which is very similar to a try-catch block in C#. If the expression causes an error, the default will be used instead. Details on the try-expression can be found in the Microsoft Power Query for Excel Formula Language Specification (PDF) which can be found here and is a must read for everyone interested in the M language. We could further replace our column A by the new column A_cleaned to hide this error handling transformation. As you can see we get quite a lot of columns here. We could e.g. use A_Try.HasError to filter out error rows (similar to error-handling on row-level) or we could use it in a calculated column to mimic error-handling on cell-level. What you want to do with all the information is up to you, but in case you don’t need it you should remove all unnecessary columns. Some time ago Bob Duffy blogged about on how to use Power Pivot to analyze the disk usage of multidimensional Analysis Services models (here). He uses a an VBA macro to pull meta data like filename, path, extension, etc. from the file system or to be more specific from the data directory of Analysis Services. Analysis Services stores all its data in different files with specific extensions so it is possible to link those files to multidimensional objects in terms of attributes, facts, aggregations, etc. Based on this data we can analyze how our data is distributed. Do we have too big dimensions? Which attribute uses the most space? Do our facts consume most of the space (very likely)? If yes, how much of it is real data and how big are my aggregations – if they are processed at all?!? – These are very common and also important things to know for an Analysis Services developer. So Bob Duffy’s solution can be really useful. The only thing I did not like about it was the fact that it uses a VBA macro to get the data. This made me think and I came up with the idea of using Power Query to get this data. Btw, make sure to check out the latest release, there have been a lot of improvements recently! You can very easily see, how big your facts are, the distribution between base-data and Aggregations, the Dimensions sizes and you can drill down to each individual file! You can of course also create a Power View report if you want to. All visualizations are up to you, this is just a very simple example of a report. Enjoy playing around with it!